It’s no secret that Prague is bursting at the seams with history, and it’s hard to go anywhere in this city without stumbling upon some historical landmark or ancient relic. Some of these are pretty obvious, like the Old Town Square and Charles Bridge, but interesting stories can be found in even the most unexpected places. For example, you probably wouldn’t associate Prague’s underground transport system with historical tales and legends, but you may be surprised. Lots of the stations on Prague’s metro network have interesting names and stories to tell, which remain sadly unknown to so many of the city’s visitors. Pražského povstání, located on the metro C line, is a peaceful and calm part of Prague. However, it takes its name from a much more turbulent time. Translated to English, the name means ‘Prague Uprising’, and refers to the events of May 1945. Back then, Prague was under Nazi occupation, and as you can probably imagine things weren’t looking too great for the city. Tensions were running predictably high and eventually erupted into a revolt. The Czech resistance fighters stormed a radio tower on the street of Vinohradská, planning to broadcast their message of defiance across the airwaves and inspire the Czech people to take back their city. A pretty tough fight ensued against the S.S., but the Czechs emerged victorious after five days of intense fighting, and the Germans were unable to stop their message of resistance from being spread. Eventually, the Germans shifted gears and resorted to devastating air raids, which destroyed many of Prague’s historical landmarks. Faced with the threat of complete annihilation, the people of Prague were forced to make peace with their occupiers. However, the Germans had to retreat to the West, putting themselves at the mercy of the Allied forces. Another one on the C line, I.P. Pavlova is actually named after a famous historical person, rather than an event. Ivan Pavlov was a Russian physiologist, and is most famous nowadays for his principles of conditioning, which were based on his experiments with dogs. He found that if dogs were conditioned to believe they would receive food after receiving a certain stimulus, then they would begin salivating whenever they were given that stimulus, even if no food was present. This spawned a wealth of psychological research, and is still used today in psychological therapy and other fields. For his efforts, Pavlov was awarded the Nobel Prize for Physiology or Medicine, and is regarded as one of the most prominent psychologists of all time. 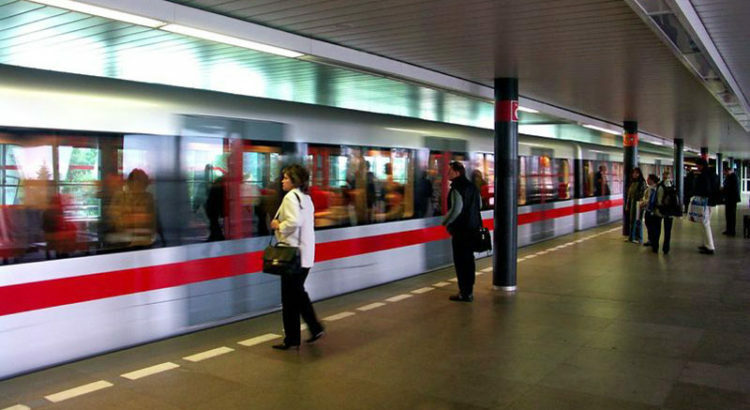 Right in the centre of Prague, Můstek connects the A and B lines of the metro, and emerges onto Wenceslas Square. This makes it one of the most significant and frequented stations in the city, and has probably been the scene of many great stories over the years. The one we’re concerned with, however, is the origin of its name. When work began on the station in the 1970s, the construction workers uncovered a small medieval bridge, dating back hundreds of years. The remains of this bridge can still be viewed today, through a panel in the station, and it serves as a reminder of Prague’s incredible age. Thanks to its location on the banks of a river, Prague has been prone to flooding throughout history, and on occasion the city has had to be rebuilt. So, deep beneath the streets of Prague lie the ruins of another city, long-forgotten until some unwitting construction workers stumble across it. If you’re unfamiliar with the Czech language, you may find it near impossible to pronounce the name of this station. It’s located pretty centrally, in the Žižkov district, and is named after the large square which sits above it. This square is named after King George (Jiří) of Bohemia, who ruled between the years 1458 and 1471. He was a leader of the Hussite party, and had an eventful reign, mired in controversy. His attempts to secure peace with Rome saw him engaged in constant negotiations with the Pope, which generally didn’t go all that well for George. He is remembered for trying to achieve European unity, a concept which was unheard of at the time, and remained elusive until the second half of the 20th Century. Jiří’s efforts can be seen as a precursor for the European Union, and a noble attempt to bring stability and peace to a divided continent. His attempts were ultimately unsuccessful, and although he managed to defend his kingship from challenges in Moravia, he died leaving the political landscape of Europe as divided as ever. His vision lives on, though, and he is remembered as an important step in the journey towards the unity and friendship that characterises European countries today. The metro station Karlovo náměstí, or Charles Square to translate, is like many things in Prague named after the decorated monarch Charles IV. More specifically, it’s named after the square above, which at 70,000 square metres is one of the largest in the world. During the medieval era, it was the largest square in Europe, and as the main square in Prague’s New Town it was hub of activity for the city. It was founded by Charles in 1348, and since then has been the scene of countless important events. In the 14th and 15th centuries it became a site of pilgrimage, as the Corpus Christi chapel in the square was home to some relics of the Holy Roman Empire. Nowadays it has lost its status of the most important square in Prague to others such as the Old Town Square and Wenceslas Square. However, it still draws tourists from all over the world, and its central location ensures that it is not forgotten. So, next time you take a ride on the metro, be reminded of the weight of history and the long tradition of legends that created Prague.